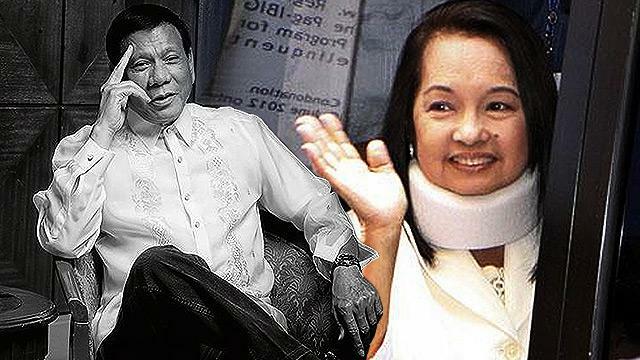 Presumptive President Rodrigo Duterte revealed that former president Gloria Macapagal-Arroyo turned down his offer for pardon. Duterte said the former president declined since she did not want to plead guilty to her plunder case, a requirement for those seeking presidential pardon, Philstar reported. “I said I want to grant her pardon not because she is my friend, but because I don’t think there is a good case against her,” explained Digong. Duterte added that he felt pity for the 69-year-old president-turned-congresswoman who was implicated in the alleged misuse of the Philippine Charity Sweepstakes Office’s P365 million intelligence funds during her presidency. Arroyo has been under hospital arrest at the Veteran’s Memorial Medical Center in Quezon City since 2011. Despite being in detention, she still won her third consecutive term as the representative of Pampanga’s second district. Arroyo is currently waiting on her petition to the Supreme Court to allow her to be placed under house arrest. Duterte has earlier stated that he was willing to grant Arroyo’s request.